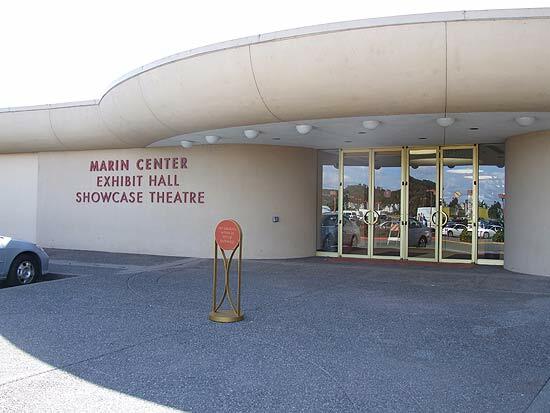 Location: Marin County Civic Center Exhibition Hall, San Rafael, California, USA. 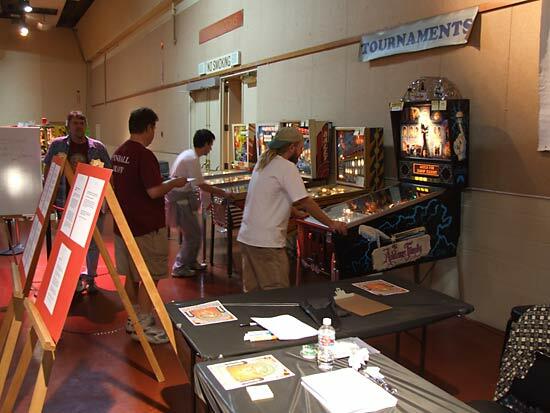 Friday 5th October 2007 will go down in history as the first day of the very first Pacific Pinball Expo show, held in San Rafael - just north of San Francisco - to raise funds for the Neptune Beach Amusement Museum. Pre-show publicity promised as many as 300 machines with the emphasis very firmly on electro-mechanicals. Would the show live up to the promises? Could 300 machines really be brought together for an inaugural event? The initial view as you came through the door immediately revealed something special had been achieved and the promotional material had it spot on. Whether there were 300 machines or not we'll discover later with the machine list, but clearly there were pins as far as the eye could see and row upon row of them. 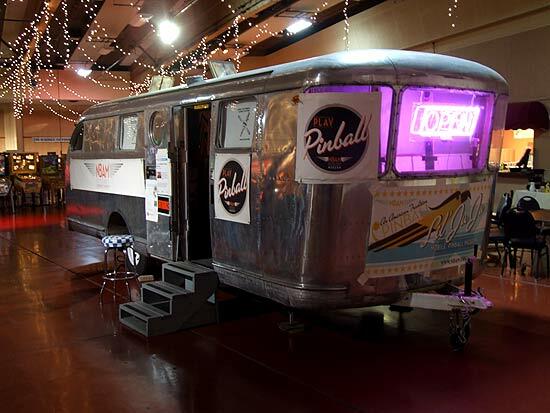 But to start at the beginning, as visitors entered the hall they were greeted by the Lil' Ju Ju trailer on the left side of the hall. Inside the Lil' Ju Ju are six pinball machines, all space themed - Mars Trek, Apollo, Sky Lab, 2001, Space Odyssey and Outer Space. 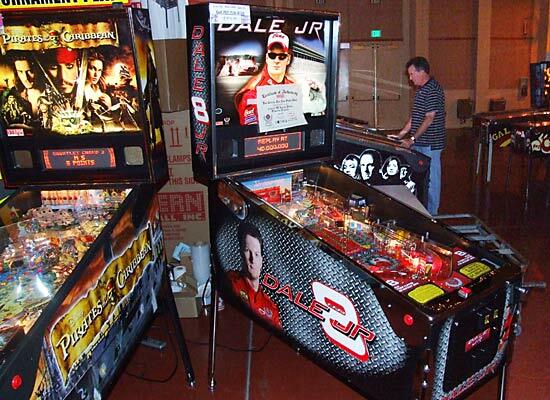 Some of the machines inside the "Lil' Ju Ju"
Next to "Lil' Ju Ju" were a selection of modern pinball machines, including some of the most recent releases from Stern such as Spider-Man, Family Guy and the Dale Jr variant of NASCAR - one of only 600 produced. 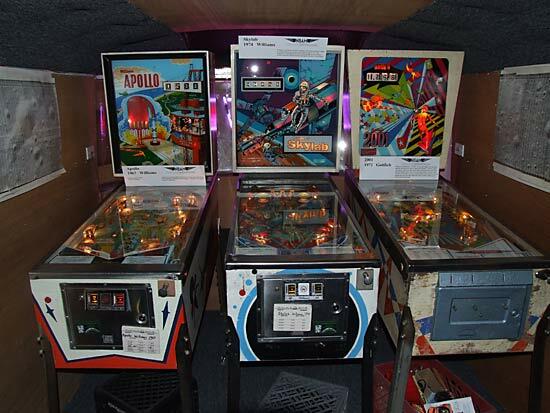 With the most modern dot matrix machines grouped together, the adjacent group included many classic solid state machines mixed including Stern's Galaxy and Earthshaker, with some less recent dot matrix machines such as Terminator 3, Twilight Zone and Fish Tales. But the vast majority of the machines were electro-mechanical with some nice collections grouped together. Gottlieb wood rails, for example, were well represented by Larry Zartarian's machines. 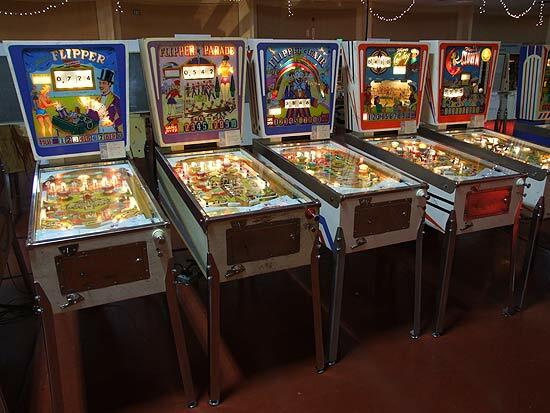 Larry also supplied this group of "Flipper" themed games. Throughout the hall, rows upon rows of single player and multi player EMs sat side-by-side with very early solid-state machines. 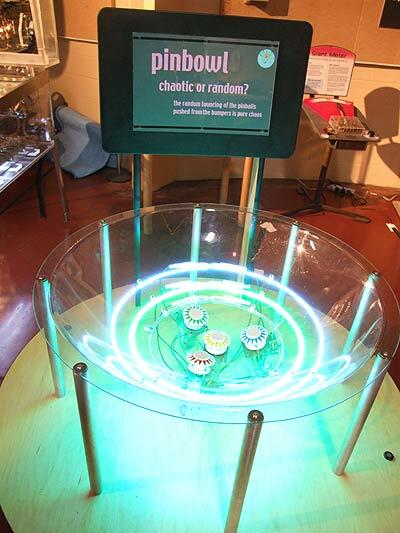 Many machines also included information cards, either on the backglass or, like the machine below, on top of the backbox. But that wasn't the limit of the educational value of the the show. 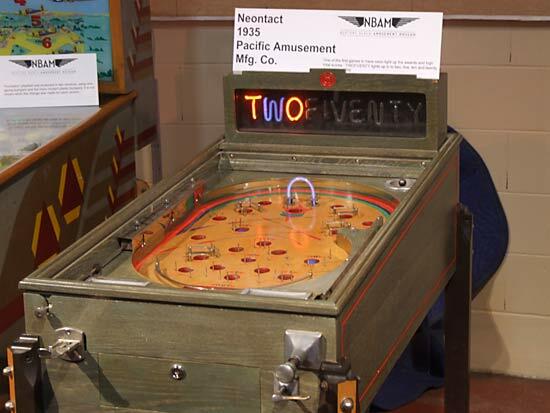 Far from it, since there were several displays set up to teach how the mechanical and electrical devices within a pinball machine operate. Probably the biggest draw was this "Visible Pinball" - a Gottlieb Surf Champ machine stripped of its wooden cabinet, backbox and playfield. 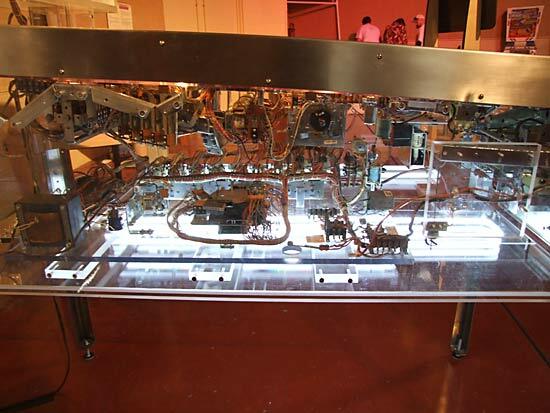 Instead, clear perspex was used to allow the full workings of the interior of the machine to be clearly displayed. 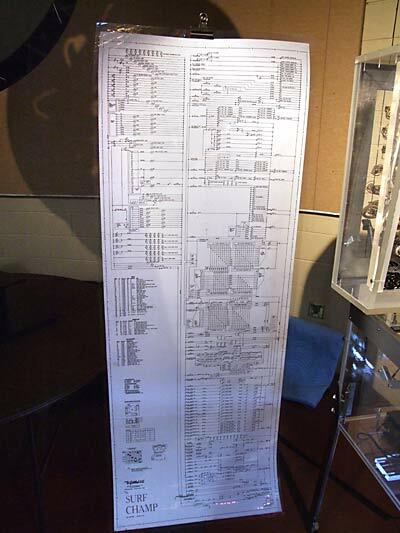 For those who wanted to try their luck following the wiring, the schematic was displayed next to the machine as was an unmodified Surf Champ for comparison. 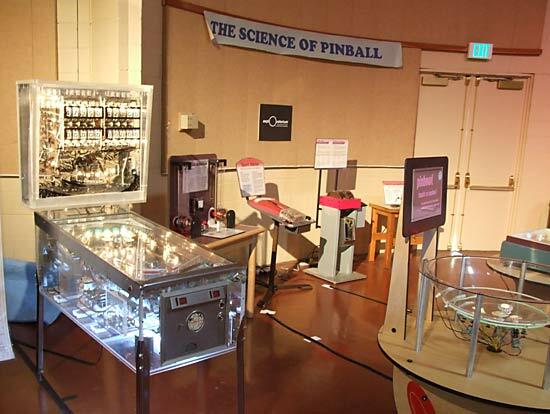 If attempting to understand how a full machine worked, other displays showed the principle of operation of different parts under the title "The Science Of Pinball"
Just along from The Science Of Pinball was a graphic demonstration of how pinball began, presented by Silver Ball Ranch's Val and Richard Conger. 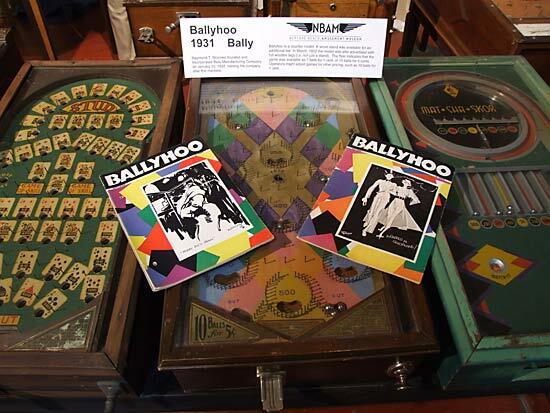 This quite extraordinary display of pre-war amusement machines tracked pinball's development from bagatelle through the pin tables which gave pinball its name, to some landmark games such as this 1931 Ballyhoo, shown here with two issues of the satirical magazine of the same name on which the machine and its colourful playfield design were based. And how about this? 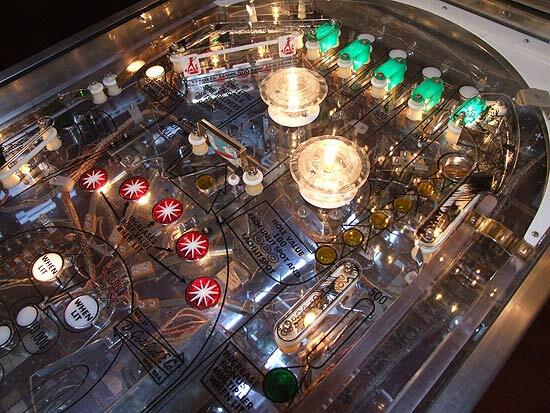 The first use of neon lighting in a pinball machine goes right back to 1935. 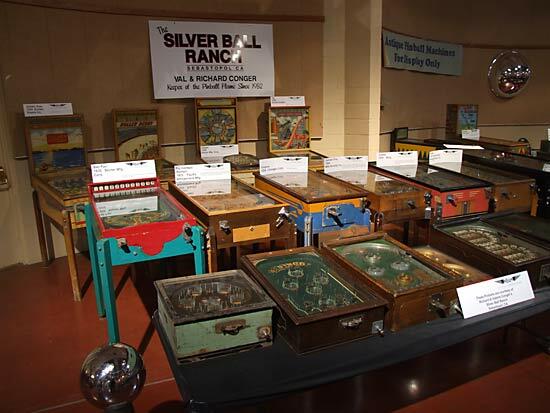 Richard Conger was happy to share his encyclopedic knowledge of these games throughout the show and even the biggest pinball fan could learn plenty as he described the games in his collection. 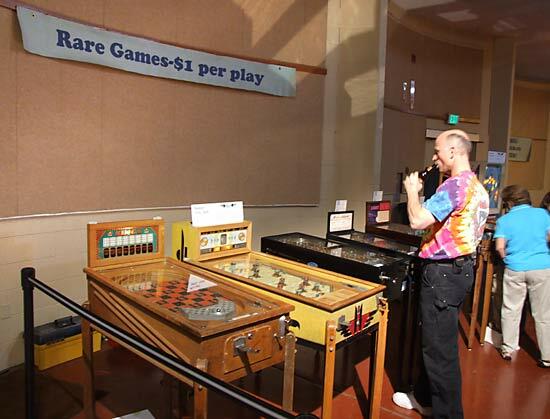 ...and the reproduction King Of Diamonds prototype machines were also on display for visitors to play and compare to the original. * indicates machine was not working at the time the list was made on Friday evening. It may have subsequently been repaired. If you count them you'll see there are three columns of one hundred machines. In other words, exactly 300 machines. But there was more to the show than just the machines. There were vendors selling various merchandise from whole games to posters, postcards, t-shirts, books, backglasses and DVDs. At the back of the hall, a number of tournaments were taking place - both individual, four player and kids along with a baseball-style tournament with a variety of prizes for the winners. The main tournament was the individual one on Saturday which had cash prizes and awarded WPPR points. 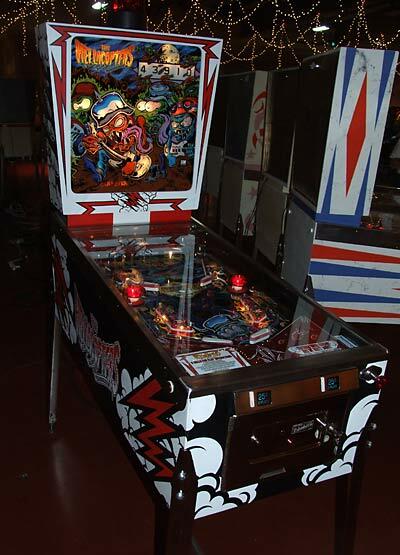 It was almost cancelled due to illness but a concerted effort allowed it to go ahead using a variation of the format used at Pinball Fantasy. Competitors bought a $10 entry which allowed them three games on any of the five machines used in the tournament. They were: 2001, Majorettes, Capt. Fantastic, Sittin Pretty and The Addams Family. The competitor's best scores on those five were then ranked and the top eight players went through to the next round. 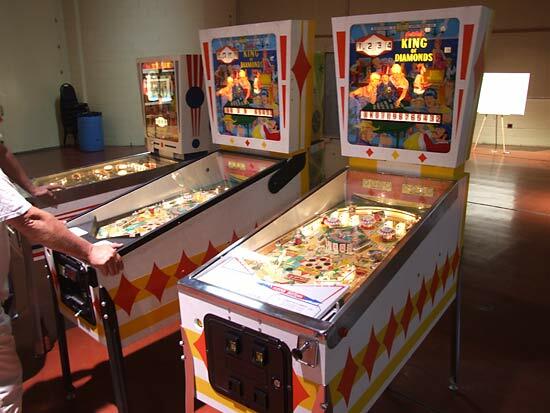 Multiple entries were allowed and in fact necessary to register a score on all five machines but in the end it was possible to qualify with just one entry if your scores on just three of the five machines were good enough. By the end of qualifying around 5pm, the following players had qualified for the quarter finals: Neil Shatz, Dan Hoekstra, Mark Conant, Jeff Neumann, Hal Erickson, Martin Ayub, Andrei Masseukoff and Jon Garber. Head-to-head best of three matches reduced those eight to four - Neil, Jeff, Hal and Jon who played the same format in the semi-finals. 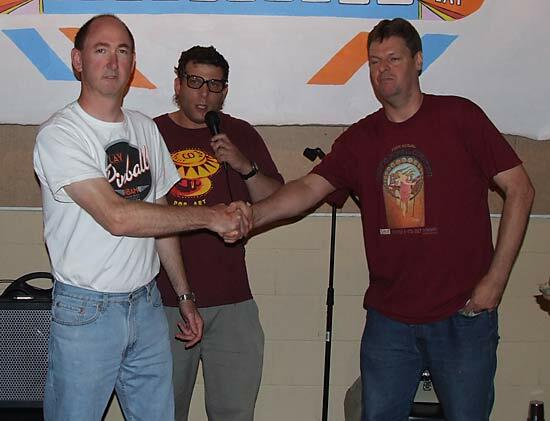 Jeff and Hal triumphed to play in the final, while Neil and Jon played for third place which Neil subsequently won. The final went down to the last game but it was Hal who took the victory and first place. 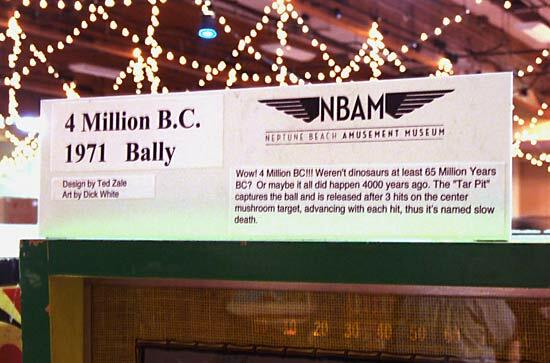 Half the entry fees went to the Neptune Beach Amusement Museum with the other half split between the top three places. Hal won $108, Jeff won $54 and Neil won $18. In the far back corner of the hall was a seminars area where a number of speakers talked about pinball maintenance, restoration, pinball science and the making of the Tilt! DVD. 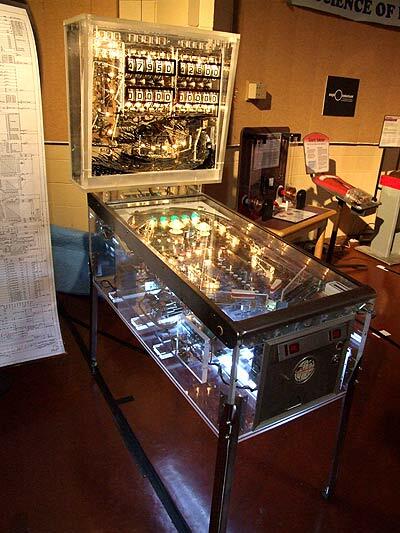 On Saturday, Chris Kuntz did a talk about how to repair early solid state pinball machines, going through the different elements of the game - lamps, switches, solenoids, displays, sound, etc - and explaining how they work and what commonly fails. He used an Evel Knievel machine to illustrate his talk. 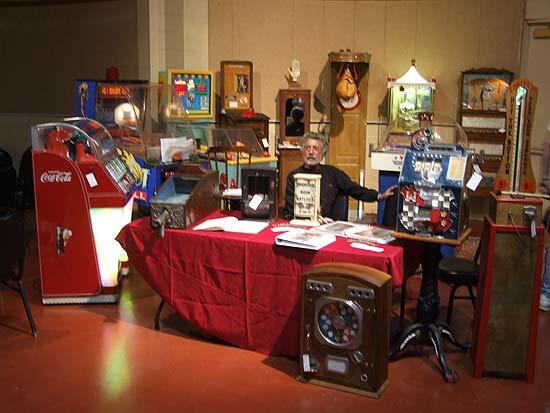 Later in the day, Bear Karmarov spoke about buying and maintaining a pinball machine, Michael Scheiss of Neptune Beach Amusement Museum (and this show) fame explained his Pinball Science project and how he plans to use and develop it. Michael Sand did a talk about techniques for restoring machines while he was followed by Jim Dietrick held a seminar on troubleshooting tips and techniques. The day was rounded off by Greg Maletic screening and then talking about his documentary Tilt! 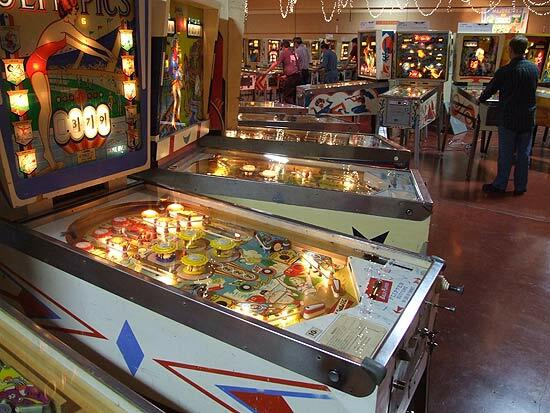 - The Battle To Save Pinball. 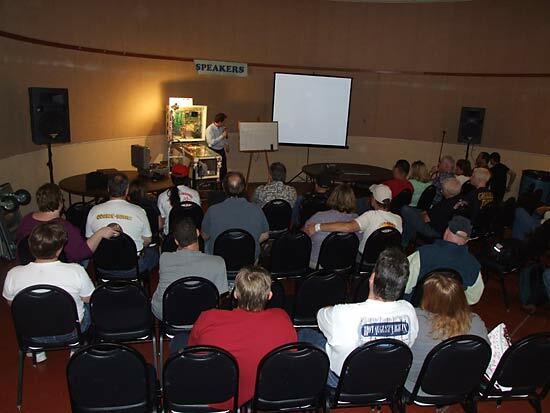 Sunday saw Michael Scheiss, Greg Maletic and Jim Dietrick reprising their seminars for a new crowd. 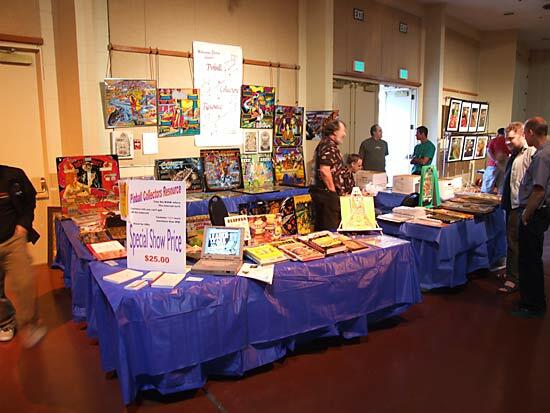 The final event of the show was the raffle where various pinball and non-pinball related prizes were awarded to lucky ticket holders. 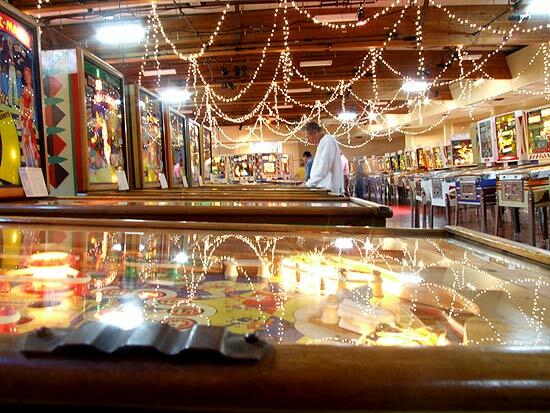 The big prizes were two pinball machines - a 300 and a Jumping Jack - which were drawn around 6pm on Sunday. John Dimarco was drawn first and opted for the "300" machine. Second to be drawn was Steve Orlando who got the "Jumping Jack". 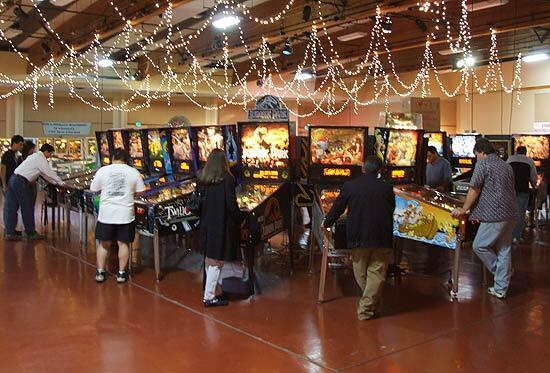 Most pinball shows tend to wind down quite early on the final day to allow machines to be packed away for the journey home, but the Pacific Pinball Expo kept going until the posted close at 8pm which meant much of the teardown would take place the following day. It did ensure the Sunday-only visitors got good value for money though. 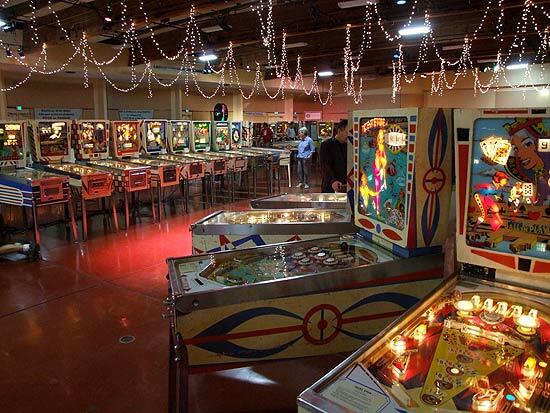 So the original goals had been met - to bring together 300 pinball machines to create a new and unique pinball show in Northern California. The proliferation of electro-mechanicals and the educational angle, when coupled with the artistic influences of the Neptune Beach Amusement Museum and the Ju-Ju really did create a unique feel to this show - the sense of something more than a bunch of machines and vendors in a big hall. 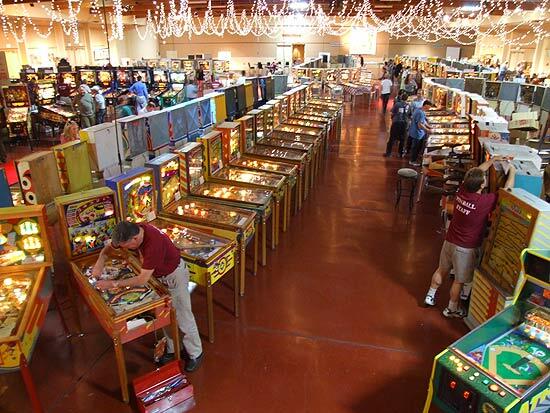 The sheer numbers are impressive of course but the inclusion of some many unusual and rare machines, combined with the tournaments and the seminars made this event worth of the moniker "Expo". Of course, none of this is possible without a huge amount of work, not only by those bringing significant parts of their private collections along to be enjoyed, but also by everyone who planned the show in the preceding months and executed it on the day. Congratulations to you all and long may the show continue. 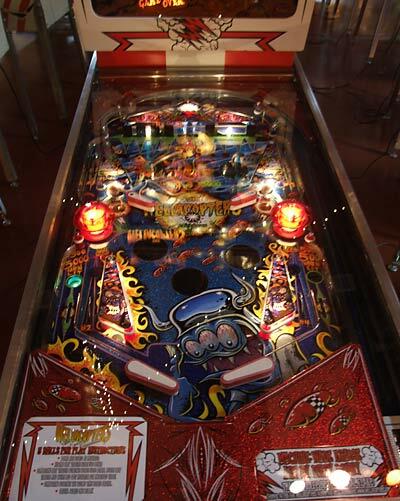 You've read about the show but now you can see it in action for yourself with our exclusive Pinball News Three Minute Tour. Simply click on the play button below and take a walk around the show.